Front cover: Aconitum carmichaelii ‘Arendsii’ (AGM). 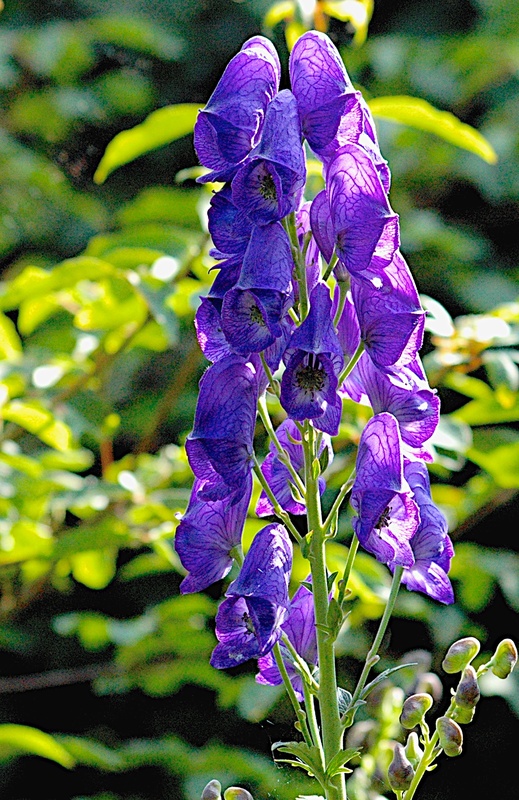 Extending the season with its rich, deep blue spires in September/October, this easy-to-grow Monkshood contrasts beautifully with the changing colours of autumn in the garden. In spring and summer it provides a dark green backdrop for showy stars of the border, coming into its own when other plants are fading. The panicles of large, hooded flowers are attractive to bees and butterflies, offering a food-source well into the autumn. Reaching a height of 5-6 ft, A. ‘Arendsii’ is very hardy and will withstand temperatures down to -40’C. Like other members of the Ranunculaceae family, its foliage is slug and snail resistant, and in my experience its stiff stems rarely require staking. The deeply-lobed, glossy foliage remains untouched by rabbit and deer. It prefers a semi-shady position in any reasonably moist soil, though ours has thrived in fairly dry shade near a beech hedge for many years. The roots are tuberous and easily divided to make new plants in early spring, when the old flowering stems should be cut down to ground-level. It also self-seeds occasionally. In our garden, A. ‘Arendsii’ sits amid the autumn fire of Acer griseum and a large Acer palmatum ‘Seiun Kaku’, against which its blue flowers appear to glow. Japanese anemones and ferns such as Dryopteris wallichiana are good companion plants too, enjoying similar conditions. All parts of the plant are extremely poisonous and are a potential skin irritant, so gloves must be worn when handling.